So one of my daughters favourite breakfast foods (or well any time foods are crepes). I came home from driving the husband to work early in the morning and it just hit me that I wanted to make her a special breakfast - (I had made cream of wheat earlier in the week and she didn't really like it). So I figured I would do crepes because honestly they are SO easy to make. Basically the batter is 5 ingredients (usually) the trick to making them is letting the batter rest and then the right technique for getting the batter even across the frying pan. But then I pulled out my new cookbook... (props to the husband) He bought me the Canadian Living - The Ultimate Cook Book for Christmas. Honestly, I looked at the outside and was wondering what the heck he was thinking - I have a ok collection of cookbooks and this one didn't seem to be on the same page of books I had been looking at recently. Frankly I wrote it off as a basic cookbook nothing special. Then I started flipping through it - the recipes in there are amazing and such a variety with a lot of good tips and tricks and information. I would HIGHLY recommend the book. 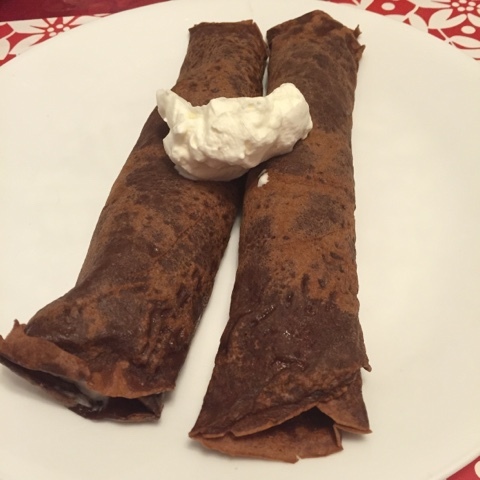 I found the basic crepe recipe and was going to do that - but then I saw the modification for chocolate crepes and decided to go for it! They were amazing. They were filled with some homemade bumble berry jam (Blueberries, strawberry and raspberry) while some Chantilly Cream and then rolled up. They tasted like a black forest cake for breakfast! The review from the Monkey was a huge hug and massive kiss. In a bowl, whisk flour with salt. Wish together eggs, milk and half of the butter (2 tbsp); pour over the flour mixture and whisk until smooth. (The book suggests straining it through a fine-mesh sieve into a clean bowl - I didn't bother) Cover and refrigerate for 1 hour (I skipped this step each time and ended up with a more rubbery crepe - it would be good for it to rest. Heat 10-inch nonstick skillet or crepe pan over medium heat. Brush the skillet with some of the remaining butter (I have it melted in a bowl with the pastry brush and keep it close on hand). Pour a not entirely full 1/3 cup of the batter into the centre of the skillet, then tilt and swirl to coat the bottom. I basically tilt the pan until the batter reaches one corner of the pan and then begin to change the tilt angle so that the entire bottom is coated. Cook, flip when the edges begins to curl away from the skillet, until set and the edge is lightly golden - about 90 seconds. Transfer to plate, cover to keep warm. Repeat starting with brushing the skillet with butter. 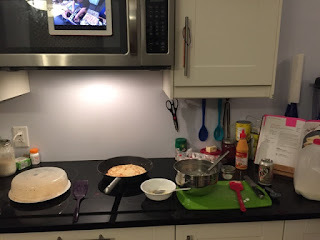 I made basic crepes for supper tonight - as my husband likes savoury food vs. sweet food. Instead of using regular salt I used curry salt (I'll have to post the recipe latter for that!). I started with just a little bit of the salt but then didn't find the batter flavourful enough so I kept going until had a good taste of the seasoning in it - because the curry salt is only part salt it didn't over pour the batter. I then filled with ham or chicken with cheese and folded up - YUM!